The Hayward fault crosses Oakland’s Temescal Regional Park. Photo courtesy Andrew AldenWhen they hear the word “geology,” many people’s first response is “earthquakes.” Various earthquake faults lurk around us, out of mind until the day they make history as they did in 1868, in 1906, in 1989 and on many lesser occasions. Geologists fear faults as much as anyone else, but they also appreciate that the tectonic movements of earthquakes, repeated thousands of times, have built and continue to maintain our distinctive landscape. And the land in turn has shaped the microclimates and soils that support our great variety of habitats. Without earthquakes, this wouldn’t be California. Faults are part of our geologic infrastructure. Earthquakes will never be as predictable as the weather, I think it’s safe to say, but if you get to know your nearest faults then earthquakes will be less of a surprise. When our local faults rupture, you will be less likely to panic and more likely to get through the event unscathed. So when I urge you to friend a fault, it’s not to infect you with a scientific hobby but to bring you a lasting practical benefit. A fault is a crack that has had movement along it. Geologists find them everywhere, and geologic maps are festooned with them. Almost all of them are inactive, though, and they’re generally obscure even to practiced eyes. You can see what I mean on the U.S. Geological Survey’s zoomable geologic map of the Bay Area. Here’s a part of it showing the area around Fremont. We can’t be expected to worry about every heavy line, can we? Thankfully, no; and not the colors and symbols either. That’s geology stuff: bedrock and contacts between stratigraphic units. But the two heaviest lines are important. 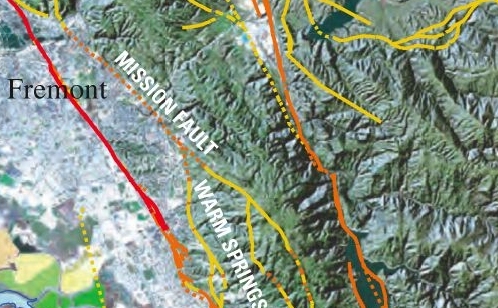 On the left is the Hayward Fault and on the right is the Calaveras fault, both capable of major shocks. Another USGS map called the Quaternary map focuses on just the active faults—well, the sort-of active ones that have moved during the Quaternary Period. You need to know only two things about the Quaternary: it’s pronounced “qua-TERN-ary” and for our purposes it includes the last 1.8 million years of geologic time. Now a fault that hasn’t moved in a million years, like a volcano that hasn’t erupted in a million years, is not much of a threat. The color codes on the faults match the time of the latest fault movement, angry red being historic time (namely, 1868). There are two good ways to visit our local faults. One is visiting them in parks (see the list below), and the other is the freelance approach of tracking them through the neighborhood. For that, the best tool is the State of California’s Alquist-Priolo Earthquake Zone Maps, which have just been placed online by the California Geological Survey. Mandated by the Alquist-Priolo Act of 1972, these maps display the locations of faults that have ruptured during Holocene time, which is geologese for the last 11,000 years. Unlike Quaternary faults, activity on these Holocene faults is a pretty sure thing. And the maps display the detailed fault traces as mapped by geologists, superimposed on a high-quality topographic map. With these, you can drive or stroll an area and assess the land for yourself. In places like downtown Hayward, the signs are plain and plentiful. In many others, you’ll wonder what the heck those geologists were seeing. (The answer is that they were looking at historical aerial photos and data, finding subtle clues on the ground, and doing a lot of connecting dots.) You’ll have a head-scratching good time, and you won’t see your landscape the same way again. Fort Ross—Take Fort Ross Road east about 0.5 mile and spot the painted line across the road; an interpretive trail is nearby. Olema—Take the Earthquake Trail near the Bear Valley Visitor Center in Point Reyes National Seashore. Los Trancos Ridge—This ridgetop park above Palo Alto has an earthquake trail along the fault. Sanborn County Park—South of Cupertino in the Santa Cruz Mountains is this park with the 2.5-mile San Andreas trail along the fault trace. San Juan Bautista—The fault runs just yards east of the mission here. Berkeley—Tour the fault in “Bear territory” including the infamous football stadium built across the fault in 1923. 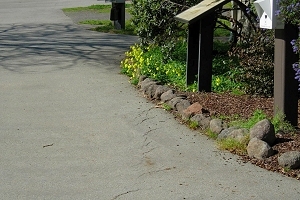 Oakland—Lake Temescal park displays the fault in several places. Hayward—The historic downtown and old City Hall straddle the fault, and signs of steady (aseismic) creep are abundant here. Andrew Alden earned his geology degree at the University of New Hampshire and moved back to the Bay Area to work at the U.S. Geological Survey for six years. He has written on geology for About.com since its founding in 1997. In 2007, he started the Oakland Geology blog, which won recognition as "Best of the East Bay" from the East Bay Express in 2010. In writing about geology in the Bay Area and surroundings, he hopes to share some of the useful and pleasurable insights that geologists give us—not just facts about the deep past, but an attitude that might be called the deep present. Read his previous contributions to QUEST, a project dedicated to exploring the Science of Sustainability.